Vistara recently received about 10 flight slots from the congested airport of Mumbai that have been left by Jet which has had to ground almost all of its planes. 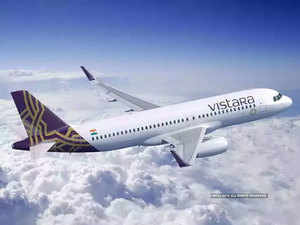 MUMBAI: Air Vistara’s long-term growth strategies will not be swayed by short-term developments, the airline’s chairman Bhaskar Bhat said while declining to comment on the Tata Group’s official stand on Jet Airways, which is up for sale. Tatas did not participate in the recent expression of interest invited for Jet Airways by its lenders, which intrigued industry watchers because the group was expected to bid given that Vistara needs to expand its network and get more landing slots to have a national reach and be viable. Lenders to Jet led by State Bank of India had invite expression of interest from potential buyers in a bid to mobilise an estimated Rs 8,500 crore for the airline’s revival at the earliest. Bhat, managing director at Titan Co and director at the group’s holding firm Tata Sons, had taken additional charge as chairman of Vistara in 2016. In November last, the Tatas held preliminary discussions to consider investment in Jet Airways. But further talks was scuttled over concerns that Jet’s promoters, the Goyals would insist on a board seat. Apprehensions about the deal’s reputational risks are also understood to have been by raised by chairman emeritus Ratan Tata in a letter tabled by a few directors before the Tata Sons board in November 2018 when the deal was first discussed by the board. Tata Sons declined to comment on market speculations. A mail to Ratan Tata on the concerns raised by him remained unanswered as of press time on Sunday. In its initial proposal to acquire Jet, Tata Sons had planned to eventually merge the two airlines to create a sizeable aviation entity. Manish Raniga, a former vice president with Jet and now an independent management consultant and aviation expert, said the group “would have greatly benefited from Jet had the deal been accepted last year”. Vistara recently obtained government approval to launch international flights. It currently operates 730 flights a week to 24 cities in the country using a fleet of 22 single-aisle Airbus A320. The airline has been slow to expand and currently accounts for just 4% of the domestic market. It aims to start international operations to Colombo in a month of two. It plans to add about 60 planes, including 10 Boeing 787 Dreamliners in the next half decade through a mix of direct orders, leases and options. The rest are Airbus A320 neos and A321 neos. Bhat said Vistara wants to be a full service airline that is desirable, not a premier airline but one known for its standards and safety. He refused to blame the government alone for the issues faced by the aviation industry, saying it’s more about “what the airlines companies need to do”. Vistara recently received about 10 flight slots from the congested airport of Mumbai that have been left by Jet which has had to ground almost all of its planes. Other airlines such as AirAsia India (Tata's other airline venture with AirAsia Bhd), IndiGo and SpiceJet too received 10 slots on average.